It was set up with 4 bedrooms, kitchen and living room downstairs, and 4 more bedrooms upstairs. All bedrooms had their own bathroom. It worked out perfectly. And I especially appreciated the en-suite bathrooms when I was spending so much time in the bathroom Monday night when I got sick. We think it was food poisoning, because it behaved much the way it did last time I had food poisoning, expect the last time I ended up in the hospital because it didn't stop. But this lasted 12 hours and was finished. And also nobody else got sick, just Mike and me. So anyway, enough about the puking. And on to more interesting things. There were supposed to be 8 of us in the house, but then we ended up adopting an extra cousin for the week. Mitra (my cousin whose wedding it was) had a friend who came by herself and we had extra bedrooms, so she joined us. Mitra's new husband Mairtin has a big family (9 siblings), and all of them, along with their parents, were so welcoming to all of us. They treated us like family and included us in everything. Mairtin and his dad led a bus tour of Cork and the surrounding area for all of us (including our houseful, Mitra's parents, grandmother, 3 aunts, and a few friends). As you'll find out, everything we did and everywhere we went included singing and dancing and laughing and fun. In other words, much hoolie and ceili. I'll be back tomorrow to tell you about how I've been blessed with the gift of eloquence. It's time to de-lurk! 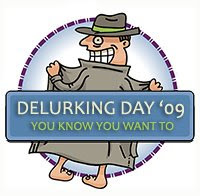 Today is annual Delurking Day, so if you're reading this, I'd love it if you would leave me a comment to let me know you were here. What a trip! (minus the puke, of course.) I showed Maria the pictures of you being silly with ML and she can't wait to be silly with you this weekend! (she's also making the cutest noises right now) I think Henry will also be glad to be silly with his girlfriend. Thanks for the trip update! I am currently hoping not to be puking my guts out in the next day or two (Phil was sick today). Have a fantastic time in FL - I'm so jealous!! !